Half Meme Press creates odd little role-playing games with names like Acts of Evil, Bacchanal, and The Valedictorian’s Death. Their most recent is My Life with Master, in which you play the minion of, um, a master. Imagine a gothic countryside burg, like the quite Bavarian steppes where Victor Frankenstein might have lived, or the brambly swamps of Dracula’s castle. We’re talking Eastern Europe before communism, when science was just kissing the brittle lips of superstition and stable poverty. The game begins by the group collectively designing a “Master”, the otherworldly antagonist who dwells in some archetypal castle or haunted house or ancient catacomb. This master has some kind of M.O. – discovering the secret of eternal life, rejuvenation, astral projection, or maybe just a nice skin suit, get creative. Then the players design their characters, minions of this master, complete with a tragic flaw and constrained power. Then the real game begins. I like the idea of a game that lets me unleash my inner psychopath. Here’s Play This Thing’s review of the game. You can buy it in downloadable or dead-tree form at the Half Meme Press site. Craftster recently challenged its members to remake a board game into some new item, using as many parts of the game as possible. The dresses made of Uno cards and Monopoly money are pretty awesome, but I simply love Nekoneko’s ouija board lamp. Her method involved carefully scraping a thrift-store ouija board off of its backing and gluing it onto a similar-sized lampshade. It’d probably be possible to do something similar using a photograph or scan of the board, which would also allow you to re-size the image to fit a different lampshade. A home printer probably isn’t up to the task, but copy shops like Kinko’s usually offer oversize printing. The bird’s nest on top of this lamp is cute, but I think I’d prefer something a little less flammable sitting on top of my light bulb. I like the inclusion of the planchette in the design, though. NECA’s newest “cult classics” action figure features the very creepy scene from The Exorcist where a possessed Regan does the spider walk downstairs. It’ll be out in September, but is available for pre-order several places online (such as here and here) for about $16. This would be cute as an office desk accessory, and reasonably effective at keeping people out of your cubicle. Although not nearly as effective as something featuring pea soup would be. 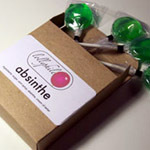 Here’s a truly awesome party favor: Lollipops made with real absinthe. Absinthe has been banned in the U.S. since 1912, but in 2007 an exception was made for “low-thujone” absinthe. The fine folks at Lollyphile are now exploiting that loophole for your delectation. Our Absinthe Lollipops are really freaking awesome. And we say that without even an ounce of hubris- people go crazy (not like, cut-your-ear-off crazy, tho) for them. It’s a shame they’re relatively expensive; otherwise I’d be awfully tempted to hand these out at Halloween. The Literacy Site is offering these cute Bat Nap earrings in their shop. They’re sterling silver with cloisonné enamel and feature a couple of charming chiroptera who want to hibernate on your ears. For each pair of earrings purchased, the site will buy a book for an underprivileged child. There’s some other offbeat stuff available if you dig around on the site. This Tibetan healing stone is rather striking, as is this amethyst ring. Every purchase buys books for children, which is certainly a noble cause. It’s always nice to be able to spend money on oneself and claim that you’re doing it in the name of civic responsibility. The Vampire Damien (and his lovely wife, Vanessa) are Goths Extraordinaire. They recently made over their bedroom in an all-goth theme, and it’s simply wonderful. Many of these decorative elements are inexpensive, demonstrating that it’s possible to achieve an awesome effect without breaking the budget if you select wisely. They also note that they rent, so many of their suggestions should work for those who can’t make permanent changes to a room. Time to thin out the ol’ Drafts folder again. I’m like a link pack rat. Hitchcock Bathroom – Cute bathroom makeover with a “Psycho” motif. Includes a dripping-blood ceiling border. Bookscans – Database with thousands of vintage book covers. These would be perfect for artwork or craft projects. Darkspectre – Morganna makes amazing custom costumes and goth apparel. I own one of her cloaks and can attest to their quality. Skull Towels – Cute bath towels with a skull-and-crossbones design. I like the pink-and-black ones. Half Past a Button – The Felt Mouse made some adorable clocks using buttons to mark the numbers. It’d be fun to do something similar using novelty Halloween buttons and antique-looking clock hands. Meet Chauncy – Adorable little knit felted skull. BoneClones – This company specializes in replica bones, and they’ve got an amazing collection of animal and human skulls. They’re expensive, but the quality looks excellent. If you’re redecorating, this might be a neat place to pick up a conversation piece for the living room. Skull Plushies – Adorable little plush keychains and refrigerator magnets in the shape of skulls. The Button Drawer – Lots of unique Halloween buttons, including some metal skulls that would look great on a dress shirt. Baby’s First Mythos – Teach your little ones their ABCs using Lovecraftian imagery. DIY Wall Decor – Quick guide to sprucing up walls and doors using paper and fabric. The decorations can be easily peeled off when you move, so you can goth up your apartment without making your landlord cranky. Checks in the Mail has just begun offering these adorable NMBC-themed checks. It looks like they offer a matching leather cover, too. Beware: Many check printers offer special seasonal designs around Halloween and then promptly discontinue them, so if you find a design you like it’s a good idea to stock up. I used to use a “Classic Movie Monsters” theme, and was heartbroken when it was no longer available. To avoid disappointment, I now use my own design. As I mentioned previously, I had custom checks made from a graveyard photograph that I took a couple of years ago. They make me happy every time I get out my checkbook. If you’ve got a favorite spooky photograph or drawing, this would be a fun way to showcase it. Warner Brothers has obtained the rights to produce a feature film based on the 60’s soap opera Dark Shadows. Johnny Depp will portray vampire Barnabas Collins. It looks like Tim Burton is on board to direct, and the screenplay is being written by John August, who did the scripts for Corpse Bride, Charlie and the Chocolate Factory, and Big Fish. So it sounds like they’ve got “surreal” all sewn up. The Dark Shadows TV show makes The X-Files look positively straightforward by comparison. During its five-year run it managed to wedge in vampires, ghosts, werewolves, zombies, witches, and Frankenstein-type monsters, not to mention time travel and parallel universes. It’ll be interesting to see how they manage to pare all that down into a two-hour movie. Shadow Manor is blessed with a small bat colony, and one of my favorite summer activities is sitting outside at twilight and watching bats flit overhead. As bats lose their natural habitat to development, it’s important to provide them with alternate roosting spaces. If you’ve got any patch of greenery near your home there might be bats closer than you think, so why not build a house to encourage them? The basic design is pretty straightforward; it’s really just a wooden box with some interior partitions. There’s a great tutorial for building a bat house at The National Wildlife Federation. Free plans are also available at Scott’s Bat House Page and The Organization for Bat Conservation, and Googling “bat houses” will turn up dozens more. If you’d rather buy than build, most birding supply stores and some large hardware chain stores carry ready-made houses. They’re also available many places online; Bird Sanctum has some nice basic models that aren’t too expensive, and the Backyard Bird Company has some fanciful designs that include a Bat Castle and Victorian Bat House. Bat Conservation International has some information on the criteria for a successful bat house, as well as suggestions for attracting bats, and Bat World lists some frequently-asked questions about bat houses and offers tips for proper siting. Some people may be reticent to invite bats into their lives due to fear of rabies. This is an unfortunate misconception; in reality you’re more likely to get rabies from a cow than from a bat. As the CDC points out, the disease is only transmitted via a bite or through infected material (such as saliva) getting into your eyes, nose, mouth, or an open wound. Don’t handle the bats (don’t handle any other wild animal you might run across, either), teach your kids to do the same, and you’ll be fine. Build a house, put it up, and soon you too might have the opportunity to spy the little night mice flitting happily overhead.